Corps Officers (CO’s): The minister/minsters in charge of a Corps (Church). Our current Corps Officers are Majors David and Jane Alton. Corps are often jointly led by a Husband and Wife (who are both officers), an individual officer or leadership may be shared between officers. Corps Sergeant Major (CSM): A lay leader who helps the Corps Officer with the running of the Corps. Our CSM is Nigel Bishop. You’ll often find Nigel manning the sound desk at the back of the hall during Sunday meetings. Young People’s Sergeant Major (YPSM): A lay leader who runs the children’s programme within the Corps. Our YPSM is Julie Forsyth but she’s nothing like a Sergeant Major, more like a loveable auntie! Bandmaster (BM): The musical leader of our adult band. 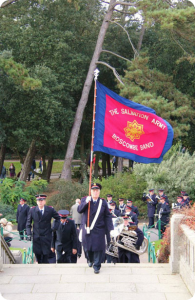 Boscombe Salvation Army Band is led by Bandmaster Dr Howard J. Evans. Songster Leader (SL): The musical leader of our adult choir. Boscombe Salvation Army Songsters are led by Songster Leader Helen Main. Young People’s Band Leader (YPBL): The musical leader of our junior band. Our YP Band Leader is Fraser Smith. Young People’s Singing Company Leader (YPSCL): The musical leader of our junior choir. Our Singing Company Leader is Katie Whittingham. The General: The worldwide leader of The Salvation Army. 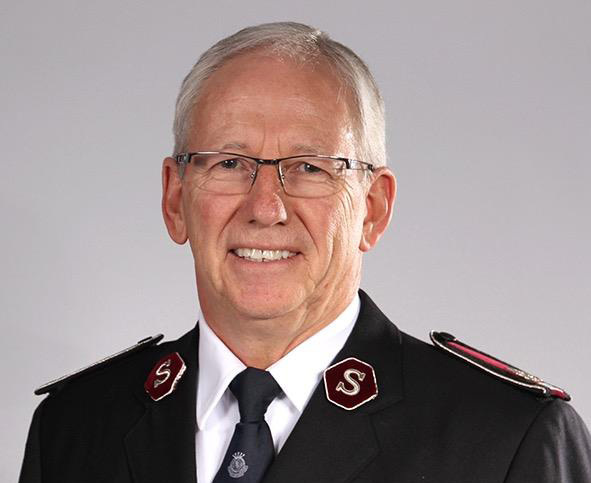 Our current leader is General Brian Peddle (pictured) and he is the 21st General of The Salvation Army. The original “General” of the Salvation Army was William Booth, right back at the very beginning – over 150 years ago! Junior Soldier: A junior member of The Salvation Army who has made their commitment public. You’ll usually see Junior Soldiers wearing a less formal uniform, a bit like a school uniform because they have chosen to, consisting of a sweatshirt and a polo shirt. Not all children are Junior Soldiers as the decision is down to them, but all are welcome. Salvationist: An officer, soldier or adherent member of the Salvation Army. You do not have to be a salvationist to attend, Salvation Army meetings (church services) are open to all. You’re guaranteed a warm welcome at Boscombe Salvation Army. Salvation Army Crest: This is the symbol/emblem of The Salvation Army. Take a look at the video on this page, it will explain exactly what our crest means. The flag: Designed to symbolise the essential beliefs of the movement, and today the design is largely unchanged, no matter in which parts of the world the Army operates. The flag consists of a blue border surrounding a red background, in the centre of which is a yellow star. The Army’s motto “Blood and Fire” is also inscribed on the flag, as is usually the name of the local centre each flag belongs to. “Blood and Fire” refers to the blood of Jesus Christ, who died on the cross to save us from our sins, and the fire of the Holy Spirit. The epaulettes for our senior soldiers at Boscombe are shown below. You do not have to wear uniform to be a Salvationist. Many Corps choose a specific type of trim with a purpose in mind. 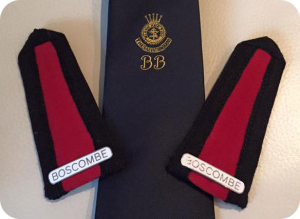 The tie in this picture below has a “BB” added to it to signify Boscombe Band. Another example would be the white caps of Southsea Band because of their proximity to the sea and naval tradition. ‘S’ on uniforms: The letter ‘S’ appears on the lapels of uniforms. It stands for ‘Salvation’ and carries the meaning ‘Saved to Serve’. Usually the patch behind these is black or blue with officers having red and high ranking officers having a trim colour around the patch as well. Mercy Seat: Our altar and place of prayer. It’s situated at the front of the hall and usually takes the form of a long piece of wood, a bit like bench (but best to kneel rather than sit on it!). Anyone can come and pray here, usually a member of our Church will come and pray with you if you would like. It’s always open to everyone but sometimes there will be a specific invitation during a meeting, perfect if you feel the need to visit the Mercy Seat and have a chat with God. Articles of War: The document that a new “Senior Soldier” signs when they are publicly sworn in as a member of The Salvation Army. It’s a promise to uphold the beliefs and adhere to the principles of The Salvation Army. Check out what it says here.